Entee Global Services are pleased to announce the launch of the PolskiBus Bus Reservation system. Following on from the success of OnniBus.com in Finland, ManaBus.com in New Zealand and SuperBus.com in Estonia, PolskiBus.com is an innovative and great value inter-city express coach service based in Poland, serving both national and international routes. 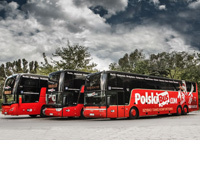 PolskiBus.com uses the latest technology and responsive web design to ensure customers have a fast, easy-to-use booking experience, powered by the robust WebRes online reservation system from Entee. To find out more about the WebRes Bus Reservation System, and how it can work for you, click here.